The minimum tread depth in the UK is 1.6mm over three-quarters of the tread and around the entire outer circumference of the tyre. Any visible damage or abnormality (sidewall or tread deformation, deep cut, split, vibration, vehicle suddenly pulling to one side, etc) must be thoroughly investigated. 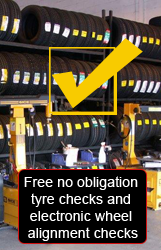 Diagnostic inspection will establish whether the tyre can be repaired or should be removed and scrapped. Running a tyre that’s under-inflated or overloaded is a common cause of damage and deterioration. The negative effects of inadequate inflation pressure are irreparable and not necessarily immediately apparent. Internal damage may not even become apparent for some time after correction of the inflation pressure. We recommend checking tyre pressures once a month, as a minimum and before any long journey, not forgetting the spare tyre. Our pressure gauges are calibrated. Check pressures ideally when tyres are cold. Under-inflated in the front or over-inflated pressure in the rear can lead to the vehicle understeering. Under-inflated in the rear or over-inflated pressure at the front can lead to the vehicle over-steering. Sloped wear: increasing from one edge to the other with feathering means there’s incorrect alignment of the front or rear wheels. 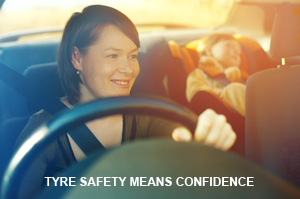 Centre wear: more pronounced in the centre of the tread than on the shoulders means the tyre is over-inflated. Tread delamination: part or all of the tread torn off means heat build-up, under or over inflated means stop use immediately, check all other tyres, check load & speed ratings, check tyre pressures. Deformation: impact damage, crushing of the sidewall between an obstacle and the rim (pavement, pot hole etc) means you should stop use immediately and check the condition of the wheel.